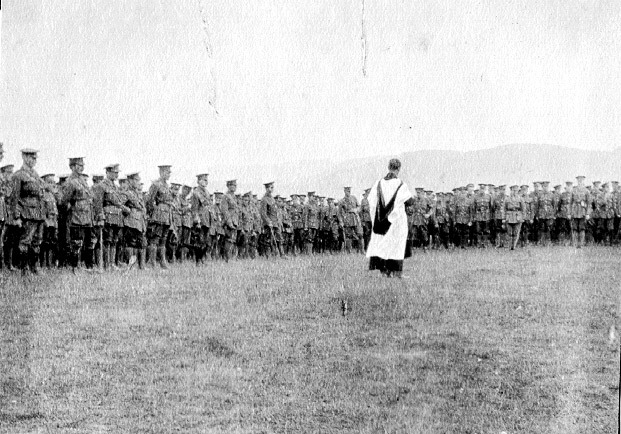 Newfoundland Regiment soldiers with unidentified women, n.d. Possibly taken outside the Bungalow at Bowring Park, St. John's, NL. Courtesy of The Rooms Provincial Archives Division (C 4-14), St. John's, NL. 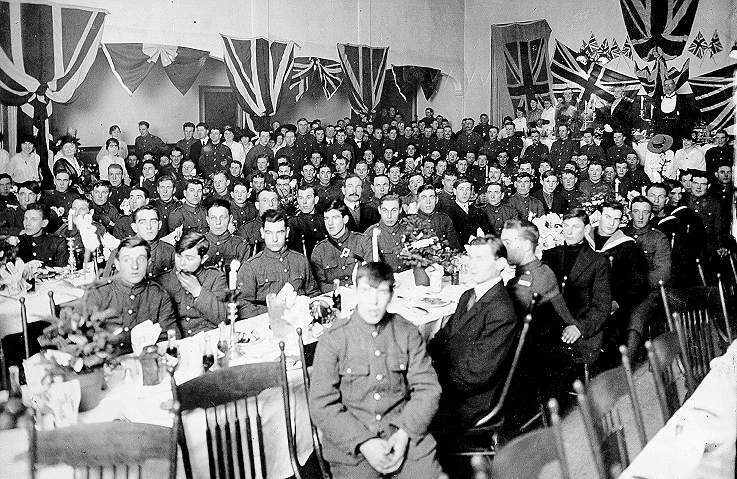 Members of the Newfoundland Regiment, Newfoundland Naval Reserve, and civilian guests at Christmas dinner hosted by Governor Sir Walter Davidson. Possibly taken at Government House. Courtesy of The Rooms Provincial Archives Division (B 3-179), St. John's, NL. Newfoundland Regiment soldiers outside Prince's Rink, St. John's, n.d. Courtesy of The Rooms Provincial Archives Division (F 34-19), St. John's, NL. 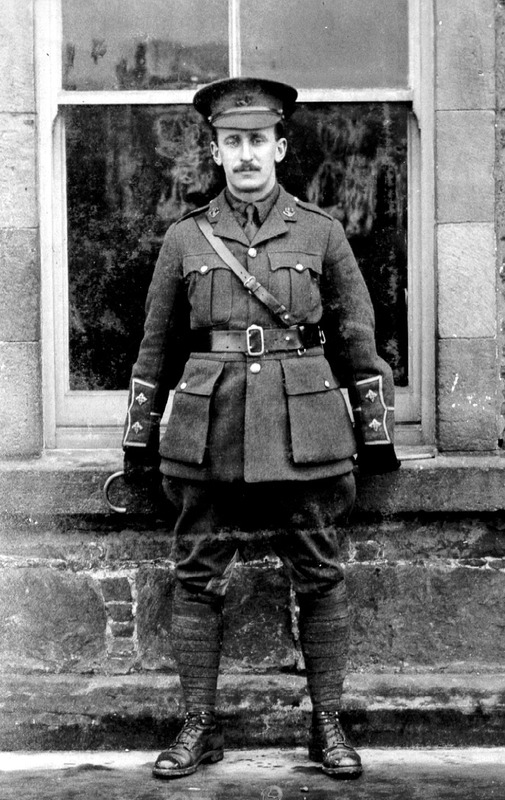 Hazen Fraser (Regt. # 2404) was the handler of Sable Chief, the mascot of the Newfoundland Regiment. Sable Chief was presented to the 2nd. 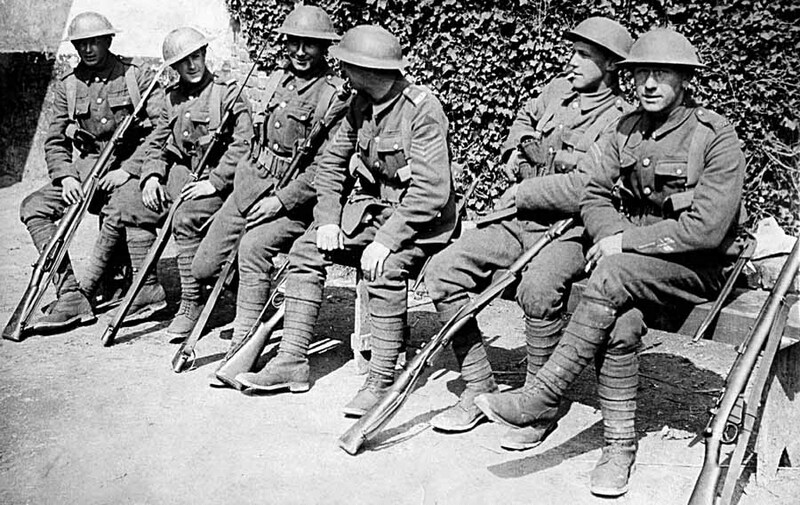 Battalion in April, 1917 by a Canadian officer at Ayr. 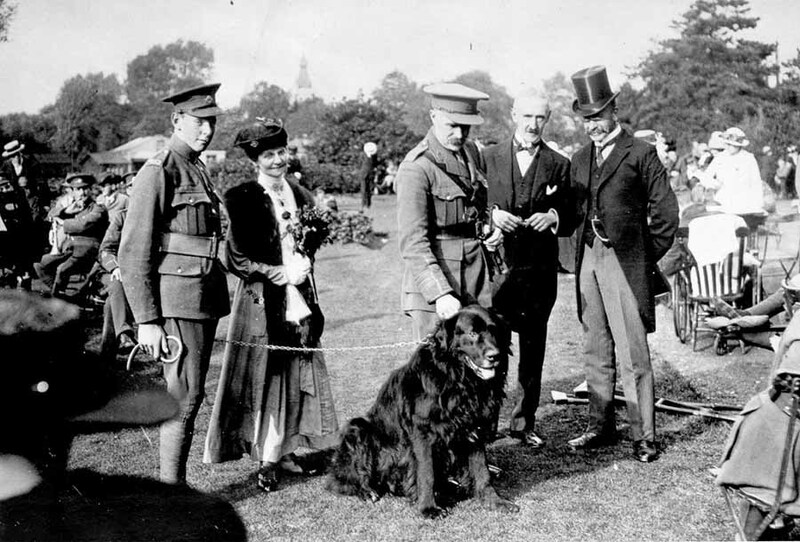 The dog was killed by a lorry in 1918. Courtesy of The Rooms Provincial Archives Division (NA 1534), St. John's, NL. Courtesy of The Rooms Provincial Archives Division (VA 37-33.6), St. John's, NL. Courtesy of The Rooms Provincial Archives Division (VA 40-10.2), St. John's, NL. Taken by Elsie Holloway, Holloway Studio (St. John's, NL). The cheque for $1025 was presented to the Women's Patriotic Association by the Curling Association, representing net funds raised by the curlers on Soldiers and Sailors Day, 24 January 1916 for war effort. The cheque is surrounded by portraits of members of the Association on its Honour Roll. Top: Cyril Carter, Dr. [Cluny] Macpherson, W. H. Franklin, James Ledingham, Charles R. Ayre. Second row: James Grieve, Frank Bennett, Gerald Harvey, Dr. [James St. Pierre] Knight. Third row: Herbert Rendell, R. C. Grieve, Harold Mitchell, Charles Duder, Jr., G. B. Tuff, Cyril Duley. Corners: William Cook, Duncan Eaton. Courtesy of The Rooms Provincial Archives Division (VA 36-8.5), St. John's, NL. Row 5, left to right: Pte. H. Janes [Harold Wesley], Regt. # 197; Pte. 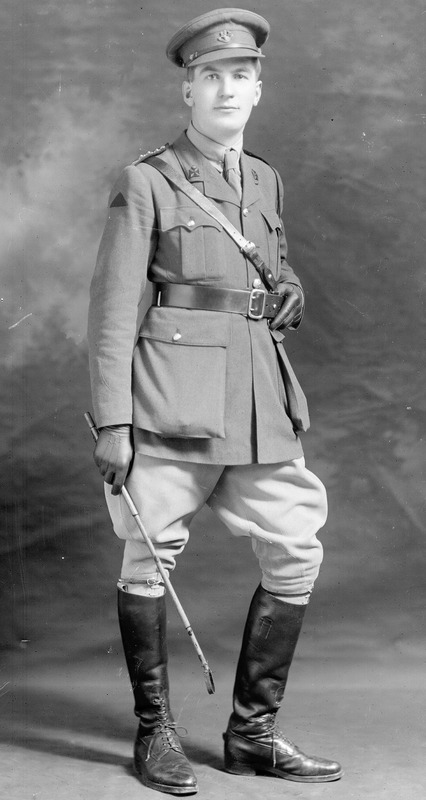 A. Mallam [Allan Wright], Regt. # 413; Sergt. L. Stick [Leonard Tretheway], Regt. # 0-71, 1; Lieut. J. Ledingham [James A. ], Regt. # 0-19; Sergt. J. McConnel [sic] [Isaiah McConnell], Regt. # 396. Courtesy of The Rooms Provincial Archives Division (F 25-13), St. John's, NL. 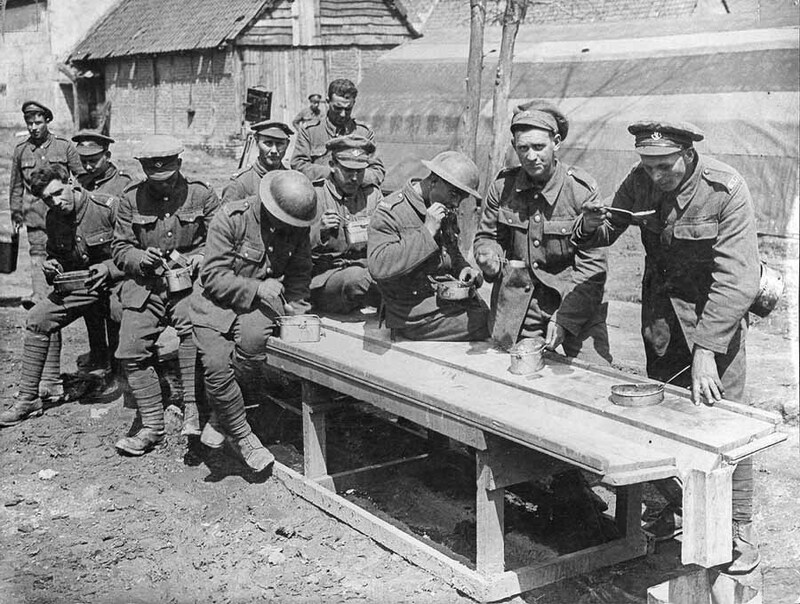 Off duty Newfoundland Regiment soldiers, France, n.d.
Newfoundland Regiment soldiers at meal time, France, n.d.
Taken by Lt. John Warwick Brook. 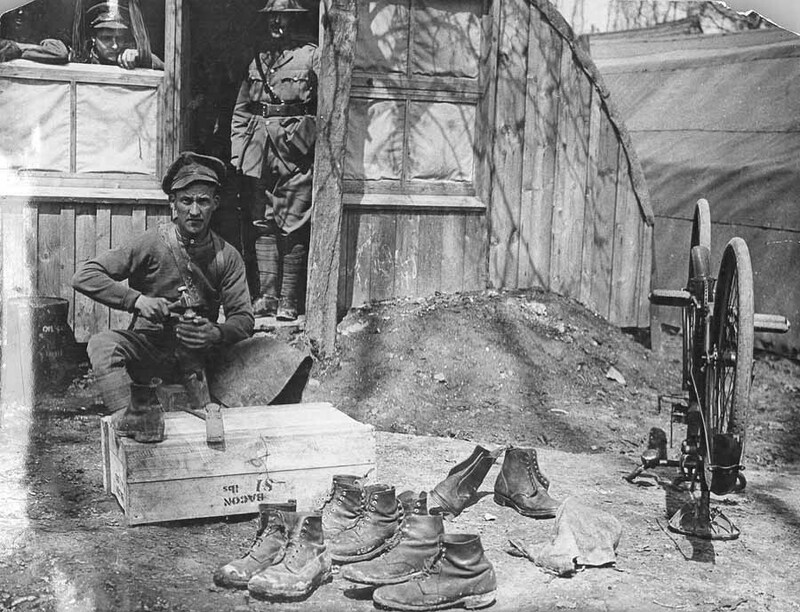 Sergeant Edward Snook, Regiment #640, Regimental cobbler. Courtesy of The Rooms Provincial Archives Division (VA-36-29-1), St. John's, NL. 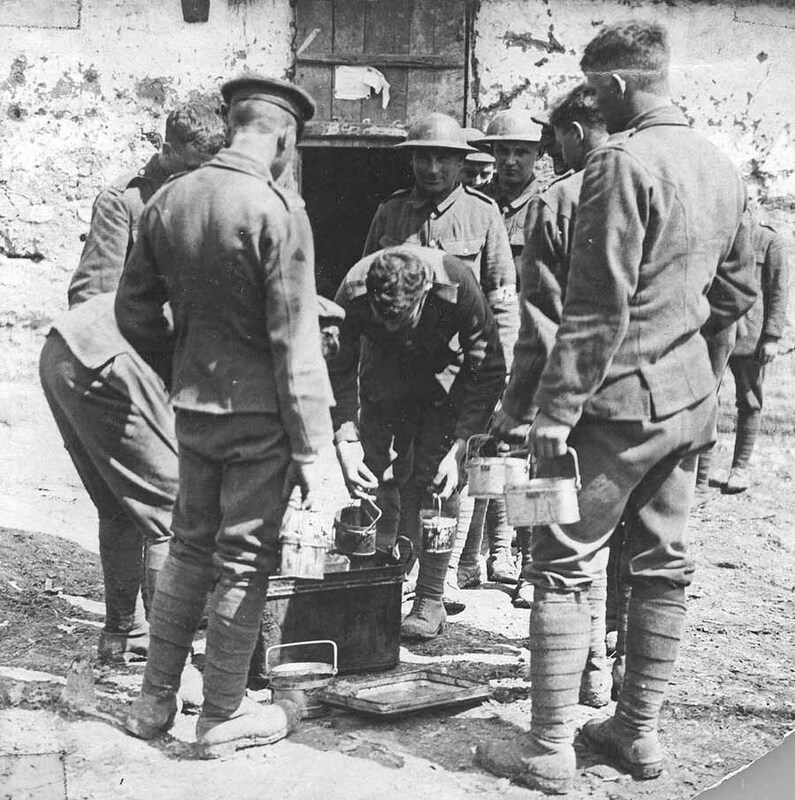 Newfoundland Regiment soldiers being issued food in their mess tins, n.d. The food was a "Mulligan" stew, made from whatever ingredients are at hand. Courtesy of The Rooms Provincial Archives Division (VA 36-29.2), St. John's, NL. Joe Goodyear and his mount, n.d.
Josiah Robert Goodyear, Regiment #573, O-166. Possibly taken at Aldershot, England. Courtesy of The Rooms Provincial Archives Division (B-3-10), St. John's, NL. 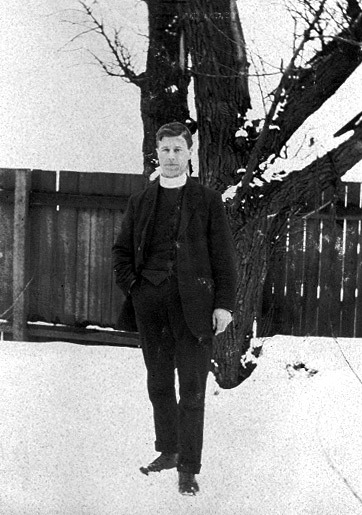 Lieutenant-Colonel Thomas Nangle, Catholic padre, n.d.
Royal Newfoundland Regiment # O-20. Courtesy of The Rooms Provincial Archives Division (F 15-6), St. John's, NL. Courtesy of The Rooms Provincial Archives Division (VA 36-8.4), St. John's, NL. Taken by O'Davis (Edinburgh, Scotland). Courtesy of The Rooms Provincial Archives Division (VA-40-16), St. John's, NL. Courtesy of The Rooms Provincial Archives Division (VA-40-19), St. John's, NL. Courtesy of The Rooms Provincial Archives Division (VA 40-10.1), St. John's, NL. 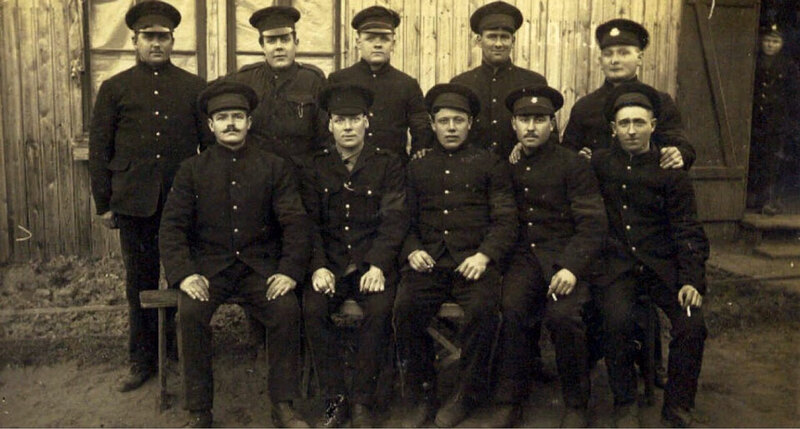 Group of Officers, 1st Newfoundland Regiment. DONNELLY, Captain, JAMES JOHN, M C. "1st Bn. 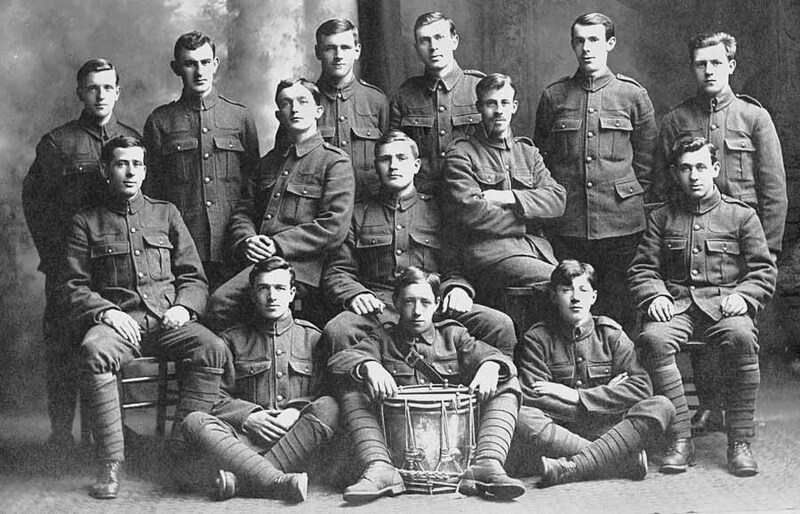 [Battalion] Royal Newfoundland Regiment. Killed in action 12th October 1916. Age 34. Son of William and Bridget Donnelly, of St. John's, NL, XII. B. 6." OUTERBRIDGE, Lieutenant, NORMAN. "1st Bn. 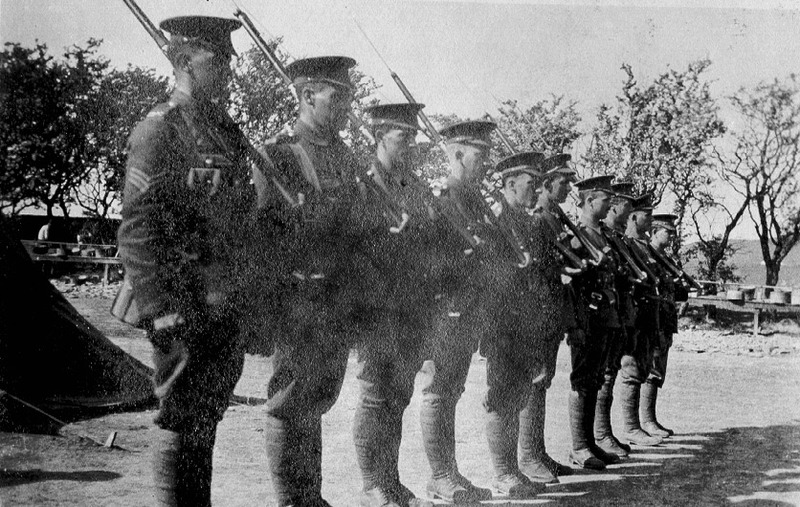 [Battalion] Royal Newfoundland Regiment. Killed in action at Monchy-le-Preux 14th April 1917. Age 33. Son of Sir Joseph and Lady Outerbridge, of St. John's; husband of Mary Evaleen Outerbridge (nee Shea), of 36, Monkstown Rd., St. John's, NL, III. A. 47." LEDINGHAM, Captain, JAMES ALLAN. 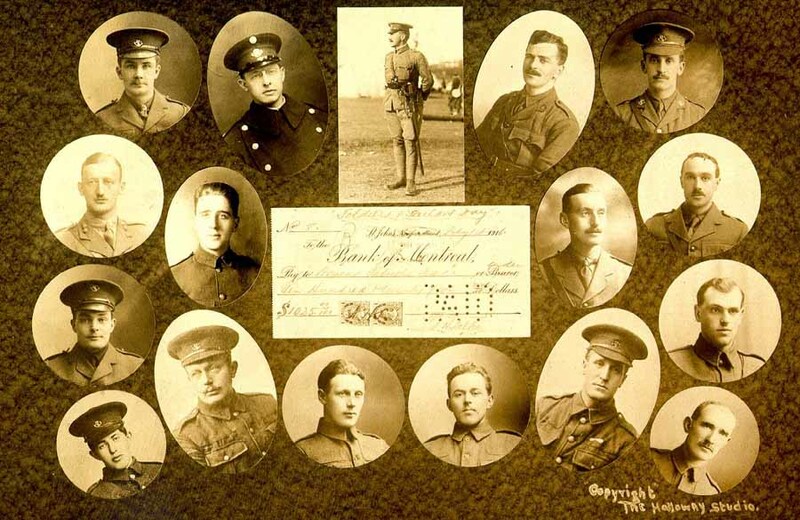 "Royal Newfoundland Regiment. Killed at Langemarck 9th October 1917. Age 29. Son of John and Anna Maria Brown Ledingham, of 35, Military Rd., St. John's." RENDELL, Captain, HERBERT, M C. "1st Bn. 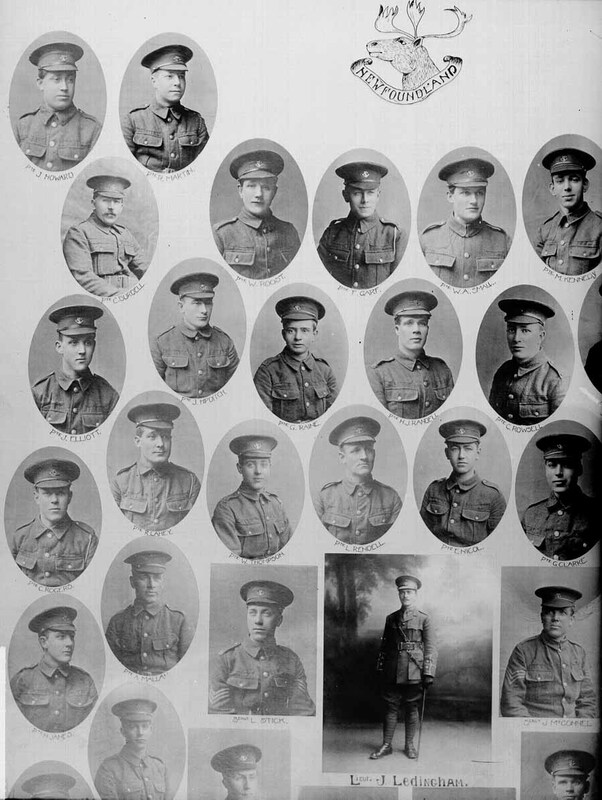 [Battalion] Royal Newfoundland Regiment. Killed in action 29th September 1918. Age 29. Son of Herbert and Lizzie Rendell, of St. John's, NL, VI. F. 16." From Commonwealth War Graves Commission, "Royal Newfoundland Regiment," World War One: The War Dead of the Commonwealth (Berkshire, England: August 1998, re-published). (Photo: Courtesy of The Rooms Provincial Archives Division, St. John's, NL. VA 37-23). (Photo: Courtesy of The Rooms Provincial Archives Division, St. John's, NL. B-3-163). Newfoundland hockey team with officials and spare men, n.d. Identified: back row l-r: Rex White, Sydney Bennett (Regiment #0-52/2895), Jack Strong, Duke Winter (Marmaduke Winter, Regiment #2896). Second row l-r: Hayward Williams (Regiment #3001), Charlie Strong (Regiment #0-9/30), Lionel Duley (Regiment #0-200/2945), Stan Newman (Stanley Newman, Regiment #0-57/36). 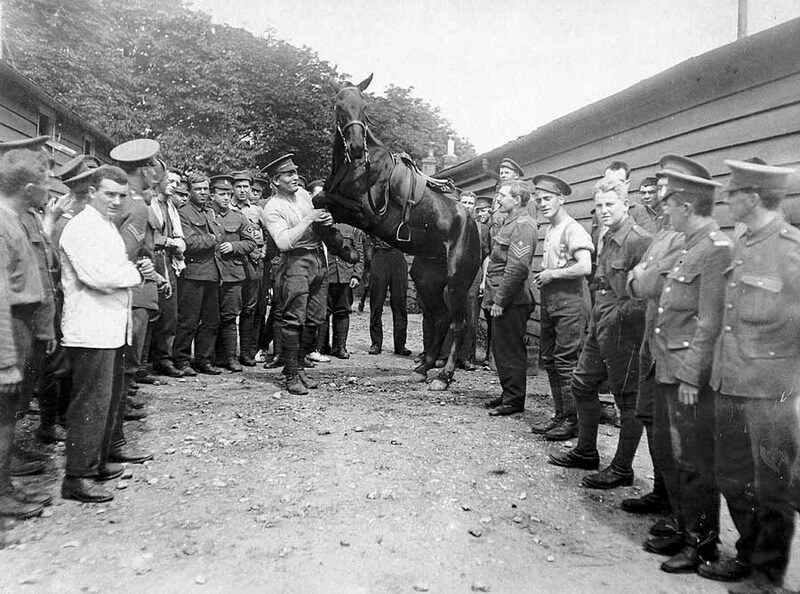 Front row l-r: Ernest Churchill (Regiment #0-108/281), Harry Mews (Regiment #0-134/2834). Players in hockey uniforms are the regular players. Those in army uniform acted as officials, goal judges, time keepers, etc. and also as spare players. 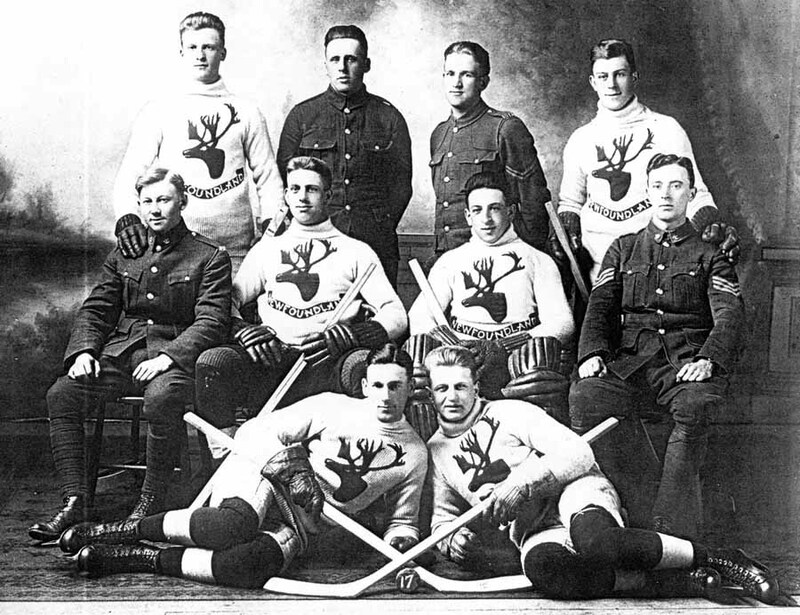 Uniforms include a sweater with a caribou crest, the Regimental emblem. 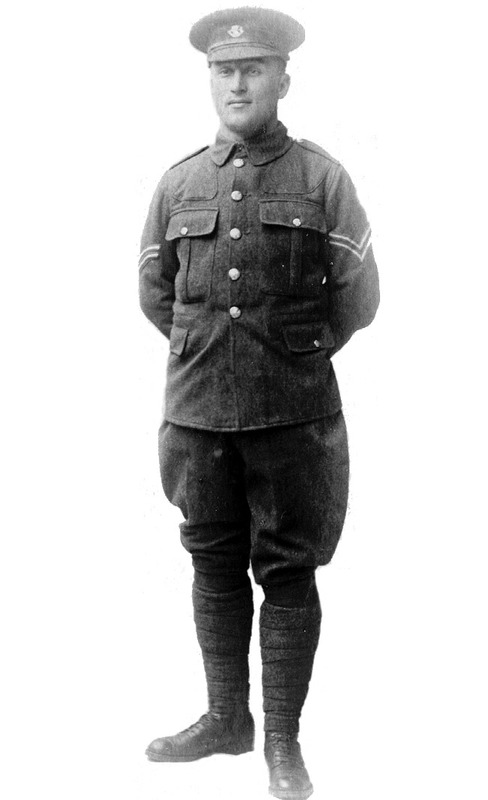 German prisoner of war camp, n.d.
Lance Corporal Hedley Rowsell of the Royal Newfoundland Regiment as a prisoner of war. He is seated front row, second from right. He was taken prisoner by the Germans on 14 April, 1917 in the Battle of Arras at Monchy le Preux and survived the war. His brother Pte. 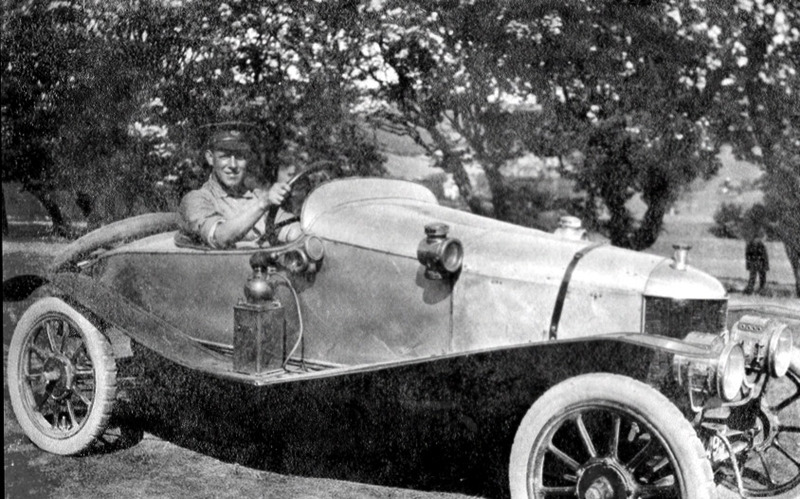 Gordon Rowsell was killed in the same action. Information and photo courtesy of Terry Rowsell. Private Garrett Burke died 1 July 1916 at Beaumont Hamel. 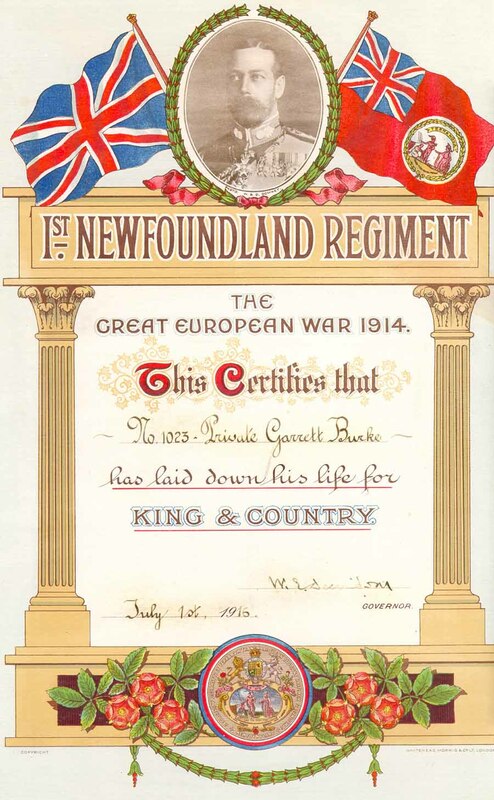 Full text: 1st Newfoundland Regiment. The Great European War 1914. This Certifies that No. 1023 Private Garrett Burke has laid down his life for King and Country. Courtesy of The Rooms Provincial Archives Division (MG 956.11), St. John's, NL.